Although I have plenty to blog about (! ), tomorrow my blog will be silent as a tribute to the victims of the tragedy at Virginia Tech, as well as to their families. See www.onedayblogsilence.com, and please join me as we pay our respects. 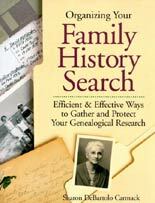 I've discovered a great printed resource in Sharon DeBartolo Carmack's Organizing Your Family History Search: Efficient & Effective Ways to Gather and Protect Your Genealogical Research (published 1999 by Betterway Books). My filing system has been needing revamping for a while. For many years, my records have been filed in folders categorized by surname (Midkiff, Robbins), location (Kent Co., Michigan; New York), and interest area (articles and seminar notes on probate records, censuses, etc.). While the location and interest area folders will probably remain the same, the surname folders are getting quite large and unwieldy. In many cases, I have three or four folders of information on the same surname, usually from different sources. After browsing the Family History Store, I decided to switch to a color-coded system using Ahnentafel numbers as my filing sequence. My father's ancestors will be filed in blue folders, my mother's in red, my father-in-law's in green, and my mother-in-law's in yellow folders (I'm using my own products purchased at Office Depot). Using the recommendations from Sharon's book, every family group or couple that I am researching will have their own folder, marked with "M24/25" or "N16/17," etc. to indicate that this folder contains information on Miriam's ancestors (numbers 24 and 25 on her pedigree chart) or Norm's ancestors (numbers 16 and 17 on his pedigree chart). Each folder will hold information on the couple's children. If the folder gets too unwieldy, I'll create a folder for each of the couple's married children, marked "M24/25.1" or "N16/17.3", showing that it contains information on the first child of my ancestors whose ahnentafel numbers are 24 and 25, or the third child of Norm's ancestors whose ahnentafel numbers are 16 and 17. Color-coded family folders, labeled by surname, containing general research information, correspondence, and photographs will still be used, but will be much thinner and easier to manage than if they had all the documents for family members stored in them. Locations and interest areas will continue to be stored in manilla folders. I am also going to use orange folders for my mother's step-father's line and purple folders for my paternal grandmother's adoptive line, as I have done extensive research on these families. Although not biological ancestors, they have greatly influenced what my family is and who I am. Oh No! Not More Files! The book also includes an appendix, addresses, a bibliography, organization forms for genealogists, and an index. All of the forms in this book are freely available online at Family Tree Magazine. I can't recommend this book enough. Check it out at your local library or bookstore and see if you don't agree that this is a useful resource! Free Access to World Vital Records at Family History Centers! Leland Meitzler at Genealogyblog.com has just posted some very good news: free access to the relatively new genealogy website, World Vital Records, will soon be available at Family History Centers everywhere! Go here to read all the details. April 1st was Census Day for the 1930 U.S. Federal Census. In honor of that census day, throughout the month of April I am posting lists of my known direct ancestors and where they were residing during that census. I'll also list who's missing; for us family historians, missing individuals on census records can be the most frustrating and intriguing challenges of genealogy! I have already mentioned one of my paternal great-grandmothers, Marie LEWIS here, and in this post we will take a look at her parents, George Emmett LEWIS and Mary J. WILKINSON. They had a large family of 13 children, eleven of whom survived infancy. Their eldest son, George R. LEWIS was killed as a young man in a motorcycle accident in 1913 (read about it here). So in 1930, George, Sr. and Mary had ten living children and were living in a rented home at 1320 Sixth Street in Ward 1 of Muskegon Heights, Muskegon Co., Michigan. Although they had 10 children, only three were living at home (Donald, Bertha, and James). Four of their children were living as adults in their own homes: Harrison, my great-grandmother Marie, Percy, and Leslie. Three of their children I've not been able to find in this census: Horace, David, and Bonnie (who was married to a William SMITH at this time, making things just a bit tricky when it comes to searching for her!). My posts about my grandparents enumerated in the 1930 U.S. Federal Census would not be complete without mentioning the DeVries family. My mother was raised by her step-father, Adrian "Ed" DeVRIES, son of George Edward Benjamin DeVRIES and Josephine BUSH (also known by their original Dutch names, Jarig Egbert Binnes DeVRIES and Johanna BOS). Although Grandpa DeVRIES may have been a step-ancestor, he was always my grandpa, and nothing less! Here you can see that 13-year-old Ed was enumerated with his parents, brothers, and sister at their home at 1024 Caulfield Avenue, Grand Rapids, Kent Co., Michigan. His name is mis-spelled "Adrain," and his sister's is missing the final "-e." This home was a little house in the back of the property, often rented out for extra income; but in this case the family was living there, and the larger house (number 1022) was being rented out for $20 a month to widow Paula STEENSMA and her six children. My uncle has been researching the history of these houses, and so far has discovered that George's step-father, John Hoogstra, purchased a home on that property (originally numbered 502 Caulfield Avenue) with another gentleman and may have later bought out his partner's interest in the home. He has been searching city directories to find out exactly which address George and Josephine were living at when Ed was born. It is known that brother Ben and his wife Ruth lived in the little house for a while as newlyweds in 1946. It's been a lot of fun to discover the details, and it's quite possible that my uncle may have been bitten by the genealogy bug (at least a little bit!). As well as doing hands-on research in the Grand Rapids City Library for city directories and the Kent County courthouse for deeds and other land records, we have used the following helpful websites: Steve Morse's Obtaining Street Name Changes in One Step and Barbara Vander Mark's Genealogy, Geography and History of My City, Grand Rapids, Kent County, Michigan, an absolutely invaluable resource. In covering my grandparents' generation, I've touched on many of my great-grandparents and even one great-great-grandparent (in the first part of this series)! Now I will continue with my great-great-grandparents, and even a 3rd-great-grandparent! April 2007 Scanfest is Coming! The third monthly session of Scanfest is on its way, to be held this coming Sunday, April 29th. We will be meeting from 11:00 AM - 2:00 PM, P.D.T. on Windows Live Messenger. First a little background on Scanfest: it's a time when genealogy fans can meet online to scan their precious family photos and papers and chat with other family historians. We have met twice so far (always the last Sunday of the month), and you can read all about it here. If you would like to join us, you need two things: a Hotmail or Gmail account, and Windows Live Messenger downloaded to your computer (Mac users go here to download Microsoft Messenger for Mac). Although WLM states that it is compatible with Yahoo! e-mail accounts, we had difficulty adding Yahoo! users to our chat (perhaps ignorance on this blogger's part?). Once you have gotten set up, send me an e-mail (see my profile in the right-hand menu) and I'll add you to our chat list. You'll receive an invitation message from me in the e-mail account that you've set up for Messenger, and will need to verify that I can add you as a contact. My Messenger account is identical to my Gmail account, except that it's "@hotmail.com". I've just posted the newest set of journal prompts over at AnceStories2: Stories of Me for My Descendants. This week's topic is Your Children. I thought I'd share a little about my children: I have two, a sixteen-year-old daughter and a thirteen-year-old son. My daughter, Melissa "Missy" Joy, was named for a character in a favorite book, Love Comes Softly, by Janette Oke. I read it back when it was the first and only book the author had written. It became a series, and she became a pioneer in the Christian Fiction field. When Love Comes Softly became a movie created by Hallmark, the father's character was played by Dale Midkiff. For years, people have asked if my children's father s family was related to the actor. Recently, I made contact with a step-relative of Dale's who had done quite a bit of genealogy on his family. She was able to show me that he descended from an ancestor who has a descendant that has taken a YDNA test for our Midkiff Family Tree DNA Project. There are three or four "distinct" Midkiff families who have members who have taken the YDNA test and the results show that there is a definite connection between them all, as early as the late 1700s. So, yes, Dale is related, but we're not sure how, as we can't seem to get past my children's father's 3rd-great-grandfather Midkiff. The Lansing State Journal reports that Gov. Jennifer Granholm is considering "merging or eliminating the Department of History, Arts, and Libraries (HAL), but no decisions have been made, her office said." HAL was created in 2001 by former Gov. John Engler "after seeing value in bringing together the state's cultural agencies." HAL's website is a boon for Michigan genealogists, especially out-of-state ones like myself. There is a whole section of the site dedicated to genealogy that includes the entire 1870 U.S. Federal Census of Michigan (scanned images, indexed), the state naturalization indexes, and Michigan Cemetery Sources, to name a few. It simply is tragic that historical, cultural, and educational programs such as this department are on the block all over this country because of budget cuts. One quote from the article stated, "Although no decisions have been made, some legislators believe there's no need for 19 departments." I like to believe that there's no need for so many legislators. My maternal grandmother, Ruth Lillian HOEKSTRA, was eleven years old when she was enumerated with her parents, John Martin HOEKSTRA and Lillian Fern STRONG, and her younger sisters Hope and Mary Lou at 1815 Newark Avenue in the Third Ward of Grand Rapids, Kent Co., Michigan. Louis & Grandpa built us another new house at 1835 [sic] Newark. It was big & fine, only John had to sleep daytimes and it was so hard for me to keep the children quiet when he slept. The bathroom was upstairs--no hot water for baths--had to carry it up with pails to take a bath. John was working for the post office during this time, obviously doing the night shift. "Louis" and "Grandpa" were John's brother and father, Peter Louis Ton HOEKSTRA and Martin HOEKSTRA, who were carpenters. This was the second home they had built for the family; the first was at 1023 Gibson, SE, also in Grand Rapids. You can see that this home was worth $6,000 ($68,000 in today's money) and had electricity ("R" stands for radio, and one of the purposes of asking whether or not a family owned one was to determine how much of the population had electricity in their homes). This family moved many, many times, and it would be profitable to look at Grand Rapids city directories and especially deeds in John and Martin's names. The Washington Civil War Association and Riverside State Park will be providing a Civil War Reenactment Weekend with living history demonstrations during Memorial Day weekend, May 26 - 28, at Riverside State Park in the Equestrian Area. Visitors can take a look at the camps of the infantry, cavalry, artillery, medical staff and civilians; see how they lived; and watch their battles, which will take place Sunday and Saturday, 11:00 AM and 3:00 PM, and Monday at 12:00 noon. Admission is $7.00 per adult, with those 15 years old and under admitted free. You may pre-purchase tickets by May 15th for only $5.50 by visiting http://14thvirginiacavalry.org/spokane-falls. In previous posts on this topic, I've concentrated on my paternal grandparents and their parents. Now I will take a look at my mother's side of the family with the enumeration of her father, William VALK, then seventeen years old and living at home with his father, William James VALK, his step-mother, Ida Eva LAMBRECHT, and his many (full, half, and step) brothers and sisters. Their address was 1006 White Avenue, Grand Rapids, Kent Co., Michigan (First Ward). The first thing I noticed was that eldest child James was missing. I have done numerous unsuccessful searches for him, and have concluded that this must have been the period of time when he was enlisted in the U.S. Army. The second missing child is Oscar, who was living on Beals Road in Wyoming Township, Kent Co., Michigan, with the foster family (Henry and Agnes Yonker) that raised him throughout most of his childhood. I've mentioned the details of this family twice recently: the first in the biography of my grandfather's sister, Barbara; and the second in the post regarding his half-sister Bertha's obituary. Joyce Obland, a volunteer for Random Acts of Genealogical Kindness, obtained some obituaries for my husband's family and sent them to me this week. George Rice WESTABY, II was Norm's great-great-grandfather. George, his father-in-law, Reuben Wohlford SNOOK, and Reuben's second wife, Elizabeth NEARHOOD, were all residents of Forsyth, Rosebud Co., Montana. I've posted their obituaries on my website here. I especially like the flowery and sentimental obituary for Elizabeth. The obituaries have provided me some new information, and as I add the information to Norm's family tree database, analyzing it as I go, I'll probably come up with even more details, as well as questions to add to my research "To Do" lists. I recently found a very interesting online biography of Reuben in Progressive Men of the State of Montana, which added quite a bit to my understanding of this family. Not every blog I read is genealogical. One, although not connected to family history in its purpose, has indeed been helpful in my understanding of my ancestry. It is called In Friese Pas, which is Dutch for something along the lines of a "Frisian passport" or "appropriately Frisian." Using various translation sites gave me various results. This is a blog (available in English) by a Dutch woman named Grace who takes long walks in the countryside in the province of Friesland, the Netherlands with friends. Each week they walk to a different village. She takes photographs and gives the Frisian as well as Dutch name of the village, writes about the history, village coat of arms, points of interest, etc. I stumbled across her blog Googling for the towns of Marrum and Westernijkerk, twin towns that are the home of my VALK ancestors. It was rather gratifying seeing photos of the church they attended, a railroad station, and general views of the villages. The Frisians are an ethnic minority in the Netherlands, with a culture and language more similar to English than Dutch. They live mainly in the provinces of Friesland (thus the name) and Groningen. The Frisian Islands are a part of the province of Friesland, and extend in a northeasterly direction from the Netherlands towards Germany. There is a Frisian minority in Germany as well, but there they are called Ostfriesians (East Frisians). You may have heard of the Ostfriesians if you've heard Michael John Neill speak or read his articles or blog. If you've been lucky enough to trace your line back to the "old country," you may want to try Googling the name of the village, city or region to see if there are any modern or antique photos available online. Maybe you'll hit the jackpot like I did and actually find an English-written blog about the homeland! The 22nd Edition of the Carnival of Genealogy Is Here! Wow! Twenty-six articles by 23 bloggers covering a variety of genealogical-related topics are available for your reading pleasure at the 22nd edition of the Carnival of Genealogy! The theme this time was a "carousel": just as there is a menagerie of animals on a carousel, so is there a myriad of topics. I am having fun reading some new things by old friends and discovering some new bloggers as well. So get comfy and treat yourself to some great reads! In my last post on this topic, I presented my paternal grandmother, born Jane Marie YORK, living as Jeanne Marie HOLST with her foster (and later, adoptive) parents, Alfred Henry HOLST and Nellie May CONCIDINE. I also showed her biological brother, Harry Orlando YORK, living as James Howard ERWIN with his adoptive parents, Howard W. ERWIN and Effie M. GAUNT. However, it was the realization that I could find all of Mary Jane's siblings on the 1930 census, with the exception of her older brother James Albert BARBER, which made me decide that he had to be the key. Mary Jane was extremely close to her brother; he was a father-figure to her, as their father, Orlando BARBER, died five days after her first birthday. Jim had been one of the witnesses to Mary Jane's marriage to Howard YORK. So I started searching for him in order to find her. I couldn't find Jim in all of Michigan, so I expanded my search to include all of the United States. By using the search parameters of his first and last name, state of birth, and year of birth (1903), plus or minus 5 years, I discovered a James BARBER living in the first ward of the city of Manitowoc, Manitowoc Co., Wisconsin at 719 Jay Street. He was listed as 30 years old, employed as an engineer for a cement plant, a military veteran, whose father was born in Canada and whose mother was born in Michigan. A 57-year-old Greek immigrant, Peter CARLOS, roomed at the same address. So far, everything matched quite closely. I then searched for any woman named Mary Jane, born c. 1910, plus or minus 5 years in Manitowoc County. Lo and behold, a woman named Mary Jane KUPSH, wife of Arthur, turned up. She was born c. 1911 in Michigan, father born in Canada, mother born in Michigan. She and husband Arthur were living at 1814 Clark Street in the fifth ward of the city of Manitowoc. So far, this is only circumstantial evidence. I need to obtain a marriage record of Arthur KUPSH and Mary Jane [--?--] to determine if she is "mine." Uncle Jim's widow had never heard of Jim or Mary Jane living in Wisconsin, nor of Mary Jane being married to an Arthur KUPSH. However, Jim's widow did not marry him until 1950, so it is possible that she never knew that part of their lives. When my paternal grandfather, Robert Lewis "Bob" Robbins, was a young man, his parents, William Bryan Robbins and Marie Lewis, moved their family from the city of Muskegon Heights, Muskegon Co., Michigan, to the outskirts of rural Conklin, Ottawa Co., Michigan. Here they had a small farm, aptly named "Five Acres," which included an artesian well, a barn, a farmhouse, and plenty of room to grow food to raise a family of five children (although Bob may have been living on his own--or even married--by then). Bill and Marie bought a cow to add to their little farm; problem was, they had no way to bring it home. Now Bob had a Model A Ford car that he had bought so that he and his best friend Ray Adams could go to the World's Fair (probably the one held in New York City in 1939). Bob volunteered to go get the cow for his parents. Now this particular Model A had a single seat in the front for the driver and a large seat across the back for the passengers...a tight fit for people, and not exactly meant to transport cattle! Bob removed the back seat and somehow managed to coax the heifer into the back of his car across its width. She was, of course, too long for it, so he had to roll down the window to make room for her head. Off he started down the road back to the farm. Imagine the scene: a Model A driving down the country roads with a none-too-happy bovine staring out the window at the neighbors, no doubt mooing her frightened head off! I'm sure that sounds were not the only thing emanating from her body! Hopefully, she didn't make too much of a mess inside that Ford! As a little girl, I loved this story, and always laughed out loud when my father told it to me. I am extremely blessed to have grown up in a family of tale-tellers! For more funny stories, read Bob's biography here. I've just posted some new journal prompts over at my other blog AnceStories2: Stories of Me for My Descendants. This week's theme is the last in a three-part series about marriage, and is titled "Your Anniversaries." As I wrote out the questions, I flashed back to a humorous anniversary story of my own that I thought would be fun to share with my readers. My husband struggled with low blood sugar (hypoglycemia) for many years, and during that time refrained from using sugar in his diet, choosing artificial sweeteners or honey instead. When we planned our wedding, a church friend of my mother's (who lived in another city) was picked to make our cake. We communicated through Mom that we would like the top layer of cake to be sugar-free. That way, we knew during the reception when Norm and I fed each other a piece of wedding cake, he would not be consuming sugar. So the big day came, and after the wedding, we went to the reception hall. First of all, visually, it was not a pretty cake (and I hope to God that the lady who made it never reads this!). My wedding color was a soft pinky-peach--coral--I guess you'd call it. The cake was white with stark yellow and bright orange frosting flowers, two of my least favorite colors. That should have warned me right there. After what seemed an interminable time shaking hands and giving hugs in the reception line (three-inch heels, and we'd already stood for nearly an hour during the wedding! ), we went over to the cake table and proceeded to cut the cake. When Norm fed me the piece of wedding cake, it was all I could do not to spit it out right then and there! Yes, the top layer was sugar-free. Sugar-free as in NO sugar. No Nutra-Sweet, no Sweet'n Low, no honey. Nada. Zero. Zilch. It was like eating sawdust with shortening on top. Yellow and orange shortening, no less. What was worse was that the lady who had made the cake was at the reception, so I felt like I had to maintain that "happy bride" look. The top layer was saved in the traditional manner to be frozen and eaten for our first anniversary. The trouble was, we lived in a studio apartment with a tiny apartment-sized refrigerator with a freezer that had to be less than 1.5 cubic feet. That blasted cake took up almost all the room in the freezer: a tray of ice, pound of ground beef, and the cake. Too bad for us if we wanted ice cream. About six months into our marriage, I was struggling yet again to fit something into the freezer. Pulling out the cake that was taking up so much room, I asked my husband if he really cared that we ate it on our first anniversary. He said no (he's not one for traditions, anyway), and I couldn't stand the thought of ruining our first anniversary by eating any of that God-awful cake! I happily pitched it into the garbage. I don't remember much of our first anniversary. By then, we had moved to an old Nike missile silo base which had been converted to a microfilm-production and hard document storage facility, where we worked as caretakers. The owner, who was quite wealthy, lived like a Scrooge and expected his employees to as well. We were too poor even to go out to dinner and a movie. I suppose I probably cooked a nice meal, but at least we didn't have to eat any of that cake! I hope you'll leave a record of your anniversary memories with your descendants, too! I have a "light" weekend right now, which simply means I have more time to try to tackle the many things on my to-do list. I am working on a research article I hope to submit to a genealogical magazine, so I may not post much of anything new to my blogs this weekend. However, I did move a number of posts from my old blog site to this one last night (I started using Blogger in late January 2007, so all posts from before that time were originally located at the old site). Last night I added June and July 2006 posts. You can access these by going through my Blog Archive, located in the right-hand menu of this blog. Many of them are research log-style posts, which may not be of interest to you, unless you're researching some of the same surnames as me. There are a few articles that you may find useful, so I encourage you to go browse. I just got through participating in another meme, so rather than pass it forward to seven particular bloggers, I challenge any of you who wish to participate to do so! It's not pretty, it's still in beta, but I have uploaded a new page to my website for Forms and Handouts. Currently, there's only one graphic example shown (Cemetery Employee Interview Notes), but there are three forms available. Besides the Cemetery Employee Interview Form, I have also posted the Funeral Home Employee Interview Notes and Online Research Log. I'll get the page fancied up and post more forms and handouts soon. As the weather warms up and the roads are safe to travel again, I'm starting to hear back from various volunteers regarding obituaries and grave photos I've requested. This morning I received an e-mail from Find A Grave notifying me that one of their volunteers, Jean had submitted a photo I'd requested of the grave of my husband's great-grandfather, John Franklin MIDKIFF, I. I've mentioned John last month in a post about his daughter Dorothy here. A relative once told me that he died after accidentally drinking some contaminated water. I have not been able to obtain an obituary for him through Random Acts. Yakima isn't too far away (200 miles/3 hour drive), and I have hoped for a while to visit the Yakima Valley Genealogical Society's new library to obtain sources on both the MIDKIFFs and CHAPLINs (my mother-in-law's family), especially to find any death notice or obituary for John. The cost of gas during summer months the last few years has put a damper on genealogical road trips. However, I noticed on the society's web page that they will fulfill queries for $1.00 each - very reasonable! I may just need to fire off an e-mail to them this week...! I noticed this advertisement in the April 2007 issue of Nostalgia magazine, a local publication "reliving the memories of the Inland Northwest." The Spokane county Heritage Museums Association announces the 1st Annual "On the Trail of History" tour event. On Friday, April 27, a one-day event designed to educate, inform and connect you with an authentic historical experience begins. The Trail of History Tour can begin at any point on the map. The suggested starting point is the Mullan Military Road marker at Vista and East Sprague in front of the Plantation Restaurant. Visit historic sites and three area museums to learn more about the history of this great area. A $10.00 admission gets you in all three museums with a souvenir ticket provided at the first museum of your visit. The trail includes nine stops. The first four markers are monuments of the Mullan Military Wagon Road: "This is one of the most important pioneer-traveled routes in the Northwest. Government-sponsored and built, it connected the Columbia River to distant Fort Benton, Montana. Perhaps it can truly be called the first transcontinental road system." The fifth marker is Mt. Hope Church and Cemetery. There was lovely human-interest article in the Spokesman-Review about this pioneer cemetery recently, which I had hoped to reprint in my blog. However, the S-R's $25 re-publishing fee quickly made me change my mind! Hangman Creek is the sixth marker. "This monument is the site where Col. George Wright hung Chief Qualchen and six warriors of the Yakima Indian Tribe. It is also the site where Col. Wright signed a peace treating ending Indian warfare in the Northwest." Ah, yes, Col. Wright, the iron fist of the Army. In his determination to quell the Yakima uprisings, he punitatively and brutally vanquished every tribe in the region, peaceful or not. Markers 7, 8, and 9 are Fairfield, Rockford Military, and Spokane Valley Heritage museums, respectively. For more information, call Jayne Singleton at the Spokane Valley Heritage Museum at (509) 922-4570. Linda Palmer e-mailed me back in February, asking me to send her a copy of the Online Research form I created. I was so honored! In the course of our "conversation," I discovered that she is the blogmaster of three blogs. One is the Washington State Genealogical Society – Region II – King and Pierce Counties and the other two are for the University of Washington Certificate Program of Genealogy and Family History Alumni Association: Announcements and Recaps and In the News. She is also the webmaster for the Genealogy and Family History Alumni Association website (still in beta). As a Washington State resident and instructor of Online Genealogy for my local community college district, Linda's blogs hold a lot of personal interest for me. The lists of workshops, interest groups, and computer classes that are available on the west side of the Cascades for the genealogical community is enviable! If you are a Pacific Northwest resident, be sure to take the time to visit her blogs to find out what's cooking in our neck of the woods. If you're out-of-area, you may like to stop by and get some ideas, perhaps for your local genealogical society to implement. I have been known to be wrong a time or two, but Linda suspiciously reminds me of another blogger I know: Zoe from footnoteMaven. While Linda's blogs are professionally written in an informative, no-nonsense format, Zoe's allows for her creativity and personality to shine through. One of the first things you'll notice is the large Carnival of Genealogy poster she's designed, each one themed for the current COG edition. She's also created a clever "Blog the COG" badge for each of the carnies to post on their blogs. Don't forget her Genealogy Bloggers' Quilt, a visual blogroll of her favorite blogs, many of which are mine, too. It's not just her artwork, but her posts are worthwhile, too, and I'll especially enjoy reading her future COG posts. My then-five-and-a-half-year-old paternal grandmother, Jane Marie YORK/Jeanne Marie HOLST, is enumerated with her adoptive parents, Alfred Henry HOLST and Nellie May CONCIDINE, on Randall Street in Coopersville, Ottawa Co., Michigan, along with older adoptive sister, Lucille. Both girls' names have been mis-spelled. Note also that Jeanne is listed as an "Adopted Daughter," even though she wasn't legally adopted by the Holsts until right around her sixteenth birthday. Legally, she was only their foster child. 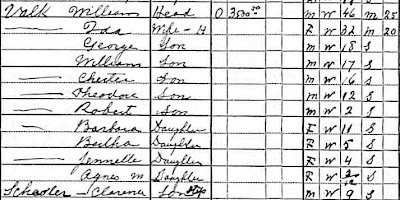 Jeanne's then-foster parents must have known something about her biological parents, because both her parents are listed as being born in Michigan; while Lucille (their biological daughter) is listed with her parents' birthplaces being Germany and Michigan, matching Alfred and Nellie's places of birth. Jeanne's biological brother, Harry Orlando YORK/James "Jim" Howard ERWIN, was enumerated just 17 homes earlier, also on Randall Street, with his adoptive parents, Howard W. ERWIN and Effie M. GAUNT. Notice that there is no "adopted son" notation for Jim. Again, his adoptive parents must have known something about his biological parents, because both his parents' birthplaces are listed as "Michigan," while his adoptive parents had been born in Illinois and Michigan. I don't know how old Uncle Jim was when he was legally adopted, but I think he must have been directly adopted from Blodgett Children's Home (in Grand Rapids, Kent Co., Michigan) instead of being fostered out for many years, like my grandmother was. While researching the adoptive families of my grandmother and her brother, I discovered that the Holsts and the Erwins were shirt-tail relations...in other words, they were related to the same people without being related to each other. I am only supposing here, as no one is alive who could tell me, that Uncle Jim was fostered out/adopted first, and then the Holsts, who had lost infant twins a few years previously and could not have more children, became interested in fostering a child of their own. They probably heard about my grandmother from the Erwin family. These children's biological parents were Howard Merkel YORK and Mary Jane BARBER. I was going to add their census information to this post, but it's getting a bit long. I'll save Howard and Mary Jane for next time. I spent over an hour yesterday analyzing and entering data into my computer which I found in the obituary of my grandaunt, Bertha Wilma (VALK) MEYERING KRAMER. I read every single fact, finding much new (to me) information, which rather surprised me, as I thought I had quite a bit of information on her already. One of the things I love about the family tree software that I have--RootsMagic--is that is has something called a SourceWizard. After I've added or edited a fact, I can then click on the SourceWizard button, and a window pops up in which I can choose one of 34 different types of sources, ranging from electronic resources such as FamilySearch.org's Ancestral File to "typical" genealogical sources like a will. Choosing a source then generates a form specific to that source. 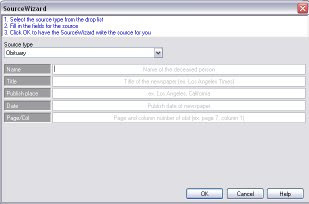 For instance, when I chose "obituary" as a source, a form opened up with the following fields: Name of the deceased person, Title of the newspaper (i.e. Los Angeles Times), Publish date of the newspaper, and Page and column number of obit (example: page 7, column 1). Because the obituary I used came from the Internet, I could also have chosen "website" as my source, but "obituary" served my purposes better, and I used the URL where I found the obituary in place of the page and column number. The great thing about the SourceWizard is it creates three types of citations: the regular (long), the short, and the bibliography version. You then can choose to edit the citation by listing the quality of the source (primary, secondary, questionable or unreliable), as well as type either the corresponding text from the source and/or your comments on the source itself. You can also choose to enter information manually (without using the SourceWizard) for those times when your source doesn't seem to fit any of the 34 options. It's then that I pull out my copy of Evidence! Citation & Analysis for the Family History by Elizabeth Shown Mills as my guide. While analyzing and entering data (32 new or edited facts!) I realized something: Bertha's surviving brother's wife, Gladys, was not mentioned in the obituary, although her widowed sisters-in-law were. I took a gander over to RootsWeb's Social Security Death Index and discovered that this sister-in-law had passed away in 2001, something I had not noticed when I analyzed the last obituary of this family (Granduncle Bob VALK, 2003). After entering all of Aunt Bertha's information (which included data on her first and second husbands, as well as her children, step-children, siblings and sisters-in-law), I entered all the information found on Aunt Gladys' SSDI listing. If Gladys had been a direct ancestor, or someone whose personal information might lead to the tearing down of a brick wall, I would have ordered a copy of her Form SS-5, the form she filled out when applying for her Social Security number. This would give me her birth date and place and parents' names, among other things. However, as she is a spouse of a step-relative, I did not want to pay $27 for information I can probably obtain through family sources. I left a Post-em (an electronic "sticky note" with a message and my contact information) in case another distant family member goes searching for her name in the SSDI, and then went over to Random Acts of Genealogical Kindness to request a copy of her obituary. While there, I requested copies of obituaries of Aunt Bertha's first husband, Elmer MEYERING, and her mother, Ida Eva (LAMBRECHT) SCHADLER VALK. 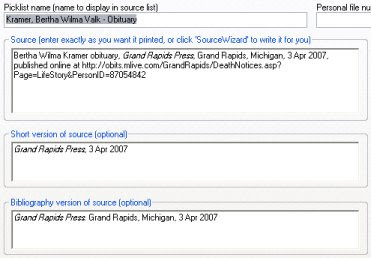 The last two are indexed in the obituary database of the Western Michigan Genealogical Society, although it took me months of searching for Ida's obit, since she's mistakenly listed as Ida "Vale" instead of "Valk." After an hour of work, I had to move on to "real life" chores, but my to-do list includes adding Aunt Bertha's obituary to my website, editing her siblings' obituaries to include her name (I edit living person's information on my website, for privacy's sake), and creating a new GEDCOM and uploading it with all its new data to my online database at RootsWeb's WorldConnect. Not all the new data I entered will be visible to others; all information on living persons is filtered out, again for privacy reasons. I also need to contact Bertha's children for missing data, such as the specific locations where she and her first husband died (all I know is "Michigan"), their marriage location, the date and place of her second marriage, and birth information of her second husband. I will also invite them to submit family group sheets of their own families and, of course, share with them our VALK family history, as well as what I've found on the LAMBRECHT family (my step-great-grandmother). This exercise was both revealing and frustrating: revealing because, as I've always discovered in analyzing my information, I came across so much more than what first meets the eye; but frustrating as I realized how much time went into citing things properly. As I've mentioned in the past, my older brand of family tree software did not have very user-friendly format for entering sources, so I chose to use the Note feature to record my sources. This was before I knew about proper citation format. I tried to always include the who, what, where, when, and sometimes why of each source, but nevertheless, I have a lot of cleanup to do to make my research meet proper genealogical standards. Even using the SourceWizard (which will cut time considerably), I have thousands of hours of work ahead of me! Well, as they say, Rome wasn't built in a day, and neither, I suppose is a family tree! Answer any or all of the following questions or simply share your thoughts about life balance. I've had to put some extra time in thought before writing this post. My first reaction was that I was the last person that ought to be writing about life balance. After all, I am a genealogist by avocation, and spend far too much time thinking, reading, blogging, and researching each day about genealogy (ask my family!). I tend to have a lot of irons in the fire (I think in my case I have many fires, each with too many irons), and life more than occasionally overwhelms me with its demands on me as a wife, mother, homemaker, employee, volunteer, and genealogist. The more I've thought about it, however, the more I've realized that my sometimes harried life really does have its own sense of balance. I have chosen to follow my passion, that of telling my ancestors' stories and helping others to do the same. So my priorities have fallen into place. In my primary job, I work with mentally and physically disabled students. One of the things they're being taught in Health and Fitness (P.E.) is juggling. In this activity, we juggle first with scarves, then with juggle balls (actually small, cube-shaped beanbags). Some of our students are learning how to throw with one hand and catch with the other. Some have moved to throwing two balls simultaneously, criss-crossing them mid-air, and catching them with the opposite hand that threw them. The more advanced students have begun to juggle with three balls. I'm learning along with them, and right now, I can juggle three balls for about five tosses before I lose track and they either all fall down, or I catch them in desperation and out of sequence. I've started to realize that juggling requires more than quick reflexes and visual tracking. It's more of an intuitive process. If I try to keep track of each ball with my eyes so that my hands can follow through, I end up fumbling. However, if I find a rhythm and simply "go with the flow,' I increase the length of my juggling act a little longer. In the same way, if I focus too much on the details in my daily life, it gets overwhelming (especially since I'm a perfectionist!). I have had to learn, time and time again, to simply find my rhythm and go with the flow; not "sweat the small stuff," but look at the big picture. It isn't easy; I have to remind myself every day; sometimes several times a day. I'm not a patient person, least of all with myself. But I have found that life balances out well when I simply pick up and try again, and leave the perfectionism and detail-obsession for when I'm doing my genealogy, where it really matters! I received an e-mail today from one of my mother's cousins, informing us of the death of my grandaunt, Bertha Wilma (VALK) MEYERING KRAMER. She was the eldest child of the marriage of my maternal great-grandfather, William James VALK, and his second wife, Ida Eva (LAMBRECHT) SCHADLER. The widowed William and Ida brought a total of eight children to their marriage (seven were his [one other died in infancy], one was hers), and then proceeded to have eight more children, five of whom survived infancy. Bertha's death leaves only two children remaining of this household: Ida's son from her first marriage, and their youngest daughter. I don't ever remember meeting Aunt Bertha, who was my maternal grandfather's younger half-sister, although it's possible I may have met her as an infant or very young child on one of our frequent visits to Michigan from Alaska. Bertha's obituary can be found online at the Grand Rapids (Michigan) Press. Update: I've analyzed Bertha's obituary here, sharing the discoveries I made. Jasia has posted the 21st Edition of the Carnival of Genealogy. I didn't participate this time around, but I encourage you to go over and browse through the selections. As always, there are a variety of well-written posts, and the theme of "Funny, Foolish, Family!" will surely make you smile. If you've never participated in the Carnival, I encourage you to do so. It's not only a lot of fun, but it forces you to both think creatively and discipline yourself to turn in a submission before the deadline. The next topic (due April 15th) will be a "carousel" edition. Jasia writes, "Just like carousels have a variety of animal figures on the ride so too will the next edition of the COG have different topics. All topics (genealogy-related of course!) are welcome. Submit any article you'd like. I already have 9 submissions so if there are even just a few more it will be the largest COG ever. It could be a wild ride... it's up to you!" Now get out of here already and go read! I promised that one of my themes for April blogging would be to list different genealogy publications and books I've been perusing. On Monday, I received the May 2007 issue of Internet Genealogy. It was like reading a hometown paper, full of news about and written by people I know either in real life or through blogging! Starting out, Lisa A. Alzo presented "Where's Wendell? A Case Study," describing her search for an ancestor of a client using primarily Internet resources. It was through Lisa's writings that I discovered one of my favorite new genealogy sites, MyHeritage.com, and I always enjoy reading her articles with the hope of finding great new online resources. Lisa is also generous enough to share a number of her published articles on her website. My friend and fellow EWGS member, Donna Potter Phillips, takes a look at the "Washington State Online Digital Archives," (www.digitalarchives.wa.gov) as a pioneer in the movement to not only provide access to historical records and images (a boon to genealogists), but also to preserve the digital history of the state (websites of former governors, "e-mail and electronic documents of governors, legislators, and other elected officials"). Marian Press examines the Internet's newest incarnation with "In Search of the Web 2.0." In the section of this article subtitled "Blogs," Marion mentions a number of popular blogs, including Genealogy Blog, Joe Beine's Genealogy Roots Blog, The Genealogue, Oxford County Genealogy Notebook, the Genealogy Blog Finder (the last three are all maintained by Chris Dunham), and Susan Kitchen's Family Oral History Using Digital Tools, to name a few. Marion also writes about Wikis and Podcasts in this definitive article. There are many other well-written and informative articles by several other authors in this issue, and I recommend you purchase a copy at your local newstand, or better yet, subscribe! The Eastern Washington Genealogical Society will be having its April meeting next Saturday, the 7th, in the meeting rooms of the main floor of the Downtown Public Library (906 W. Main Ave.). Coffee, cookies, and conversation begin at 12:30 PM. The business portion of the meeting starts at 1:00 PM, followed by our speaker, society member Bernie Middleton. His topic will be "DNA in Genealogical Research." This is an important new feature in genealogy, and if you missed Ugo Perego at the LDS Genealogical Conference last month, you won't want to miss Bernie. There's a lot we all can learn about DNA testing and how it applies to genealogy. The meeting will conclude at about 2:30 PM. Parking is available in the library parking garage (basement - access on Spokane Falls Boulevard) or nearby in River Park Square (there's a skywalk to the second floor of the library from the mall). Some people like to come early (the library opens at 10 AM) or stay late (closes at 6 PM) to do research in the genealogy room on the third floor. EWGS society volunteers, as well as the library staff, are available to assist you. "101 Clues from Old Photographs"
Hope to see you in both April and May! My paternal grandfather, Robert Lewis "Bob" ROBBINS, was nearly 10 years old, and living with his parents, William Bryan ROBBINS, Sr. and Marie LEWIS, his brothers Bill, Jr. and Lloyd ("Jack"), sister Shirley, and uncle Angelo Merrick ROBBINS, Jr. on East Broadway, in Norton Township, Muskegon County, Michigan. This may be the same house that his paternal grandparents lived in, which is listed as 2782 East Broadway, Fruitport Township in their obituaries of 1950 and 1965 (perhaps the township boundary lines changed...something to look into!). Bob's grandparents I'm referencing here are actually his paternal grandmother, Mary May "Lula" KIMBALL, and his step-grandfather, Orlando "Lan" Horace KENFIELD. The odd thing is, neither Lula nor Orlando nor her youngest son Donald Charles ROBBINS are enumerated at this address, nor anywhere else that I can find in all of the 1930 census! There is a nice group shot of Lula, Lan, Angelo and a couple of Angelo's sons on the porch of the Broadway house on Lula's AnceStory page. You may need to set your screen resolution to 800 x 600 pixels to view this page correctly. It's a whole new month, and I'm so excited! March seems to drag on forever. I'm on Spring Break, at long last, and have been enjoying the rest, relaxation, and rejuvenation. Some of the genealogy projects I'm working on this week are an article I hope to submit to a publisher soon, an upgrading and revamping of my Online Genealogy class that I teach through the Community Colleges of Spokane (my next course starts April 19th), and preparation for a speaking opportunity that I've been invited to do in North Idaho in June. April 1st was Census Day for the 1930 U.S. Federal Census, and I'll be providing excerpts of 1930 census images of my ancestors, in much the same fashion that Michael John Neill reports on the rich and famous in his blog, Rootdig.com. I'll also share about those ancestors who didn't show up on that census (we can all relate to that, I'm sure!). I've been reading some other genealogy and non-genealogy blogs, and I'll report on them. It's always fun to discover new finds! Although it's been crazily busy in March, I did find some time to read or skim through some genealogy books and publications. I'll be sharing what I've read with you. In February and March, there were a lot of genealogical happenings in the Spokane area. I mentioned a few here, here and here, but didn't have time to go into much detail. I hope to elaborate on those, because you'll find the information helpful as well. I've just posted a new prompt at my journaling blog, AnceStories2, titled "Your Wedding." It's Part Two in a three-part series (or maybe four...I haven't decided yet) about the significant person in your life, or perhaps your past. I hope you'll join us. There's several genealogy bloggers like myself who are all journaling offline, plus several people from Spokane and some of their relatives in other parts of the U.S., who are following these prompts. If you're just joining us, be sure to read the "Getting Started" prompt. You can choose to join us where we are (Week Fourteen) and then later go back and journal the earlier prompts, or you can start with Week One and move along at your own pace. Drop me a line via e-mail (see my profile in the right-hand menu) or leave a comment on the AnceStories2 blog to let me know that you've joined our "journal journey"!